In the gully was quite stable bed surface from previous avalanching. We climbed and dug outside the track on the skiers left side. I found stability to be fair to good in our location (i.e. what you might call a pocket of moderate in a low area). Moderate q1.5 hand shears and CT results at each interface between the 1F and F hard slab sections. This could have been a problem if a skier were to try to find a line through the trees in the skiers left midsection of the gully. Gully tops were pretty well scoured and heavily wind eroded. Snowpack observations are one part of the complex puzzle which is your decision to enter avalanche terrain. Some observations may include stability tests. It’s important to understand that the results of a stability tests are seldom conclusive anywhere, but particularly in snow climates and terrain like ours where the primary driver of instabilities is wind drifted snow. 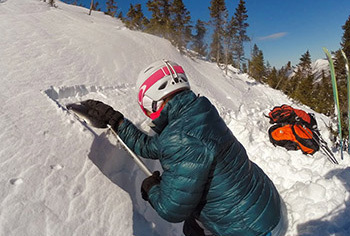 Many stability tests exist and each works best with specific avalanche problem types. Stability test results should never be used alone as an indication that a slope or conditions are safe particularly when more obvious red flags are present. Please use this page as part of your information gathering process, but don’t make decisions based on a single piece of information. A good article that summarizes some of the issues associated with snow and avalanche observations can be found here. 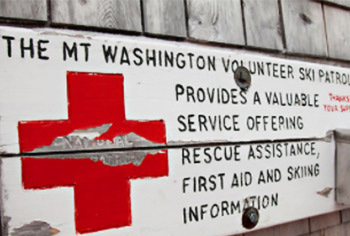 The Mount Washington Avalanche Center cannot verify the quality or accuracy of any observations that come from the general public. See an avalanche or evidence of previous avalanche activity? Near-miss? Snowpack observations? Your observations are valuable to an accurate forecast! We welcome observations from everyone. You don’t need to be an avalanche professional to submit helpful observations, just be as detailed and accurate as you can.